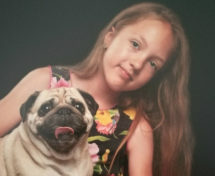 Daisy Nicholls Delo from Margate and her pet pug Jimmy will take part in Paws 4 Pilgrims on Sunday 24 March in memory of Daisy’s grandma, Pauline. 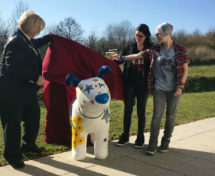 On Saturday 23 February Snowy, formerly the Pilgrims Hospices Snowpup, was unveiled at his new permanent kennel at Singleton Environment Centre. 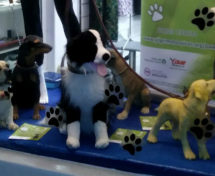 The windows of Pilgrims Hospices shop in Deal are dressed to support the Paws 4 Pilgrims sponsored dog walk that’s taking place on Sunday 24 March. 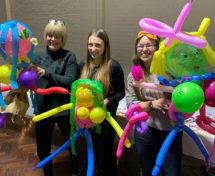 Stour Chambers’ annual charity quiz night held last month raised an impressive £4,573.10 in aid of Pilgrims Hospices. 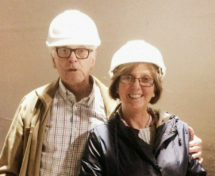 Local teacher Carol Cavanagh from Garlinge near Margate will take on a Firewalk for Pilgrims Hospices on Friday 1 March in Canterbury in memory of her dad, Albert.